The firm notes the rise of a second tier of OTT video services from services with recognized brands, including several with high profile original content. Online pay-TV services Sling TV and DIRECTV NOW round out the top ten, ahead of similar services Hulu with Live TV, YouTube TV, and PlayStation Vue. Online pay TV has been one of the fastest growing segments in the OTT video space, with aggressive marketing by all. The top subscription sports OTT video services are MLB.TV, WWE Network, and ESPN+. MLB.TV continues to lead the sports OTT subscription category, benefiting from its long tenure as a streaming service and popularity among dedicated baseball fans. WWE also has a dedicated fan base and publicly reported having over 1.2 million U.S. subscribers at the end of Q3 2018. ESPN+ is a newcomer to the OTT video marketplace but recently announced that it had exceeded 1 million subscribers. 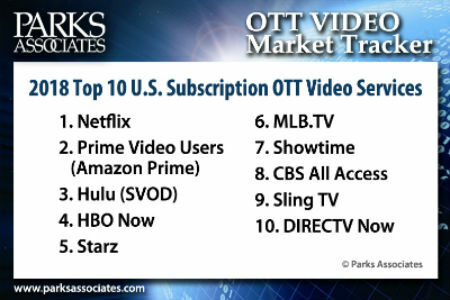 OTT video subscription penetration has reached 64% of U.S. broadband households. Over two-thirds of these households subscribe only to one of the top three services, Netflix, Prime Video, or Hulu. 36% of broadband households subscribe to two or more OTT video services. The online pay-TV audience is similar to the OTT audience—they are younger and quicker to adopt new technologies when compared to traditional pay-TV households. Over the past three years, OTT churn rates have gradually fallen each year from 31% of OTT subscriptions cancelled each year in 2015 to 28% in 2018. WWE, Key Performance Indicators – October 25, 2018. Ramachandran, Shalini. ESPN Streaming Service Surpasses One Million Subscribers. The Wall Street Journal, Sept. 20, 2018.